The train was still trundling along at its slow pace when we finally opened our eyes this morning. It took a few more hours before our cabin mate was up. He slept all through the night as well as most of the day yesterday so we’re not sure if he perhaps took a strong sleeping tablet. Either way, he departed a couple of hours before we did at one of the many stops along the way. About thirty minutes before Guangzhou (formerly known as Canton), the ticket collector came in and exchanged the little plastic cards we had received shortly after boarding the train yesterday morning with our original tickets again. We alighted after the train pulled unceremoniously into Guangzhou and did our best to locate a tourist information desk or the CITS office that was listed in the guidebook. We found neither and decided to try our luck outside of the station lobby instead. A rather friendly uniformed guard seemed to notice that we looked a bit lost and offered his assistance. I told him we needed to get to Hong Kong and asked about how to get there. My first choice was to take the two-hour ferry but he seemed insistent that there was no ferry. We think he meant that there was either no ferry today or that the twice-daily crossings had already sailed. Instead, he pointed us towards the bus ticket office. When we reached the other side of the station courtyard in the direction he pointed, all we could find was a metro entrance so we gave that a try instead. By all accounts, we are now very much out of China. This is evident by the fact that people are speaking English again and just seem friendlier as a result. At the ticket counter in the metro station, several staff members came to our aid when we made it clear that we were trying to get to Hong Kong. Their advice was to take the local metro line to the end of one of the two lines, with a changeover part way through, where we would be able to buy tickets for the high-speed through train to Kowloon. They weren’t sure about the cost of the train ticket but the metro tokens were just a few Yuan each and since we were already here, it seemed like the best option with the least hassle. Guangzhou (or Canton) is part of China but is one of several ‘special administrative zones’ just like Hong Kong. 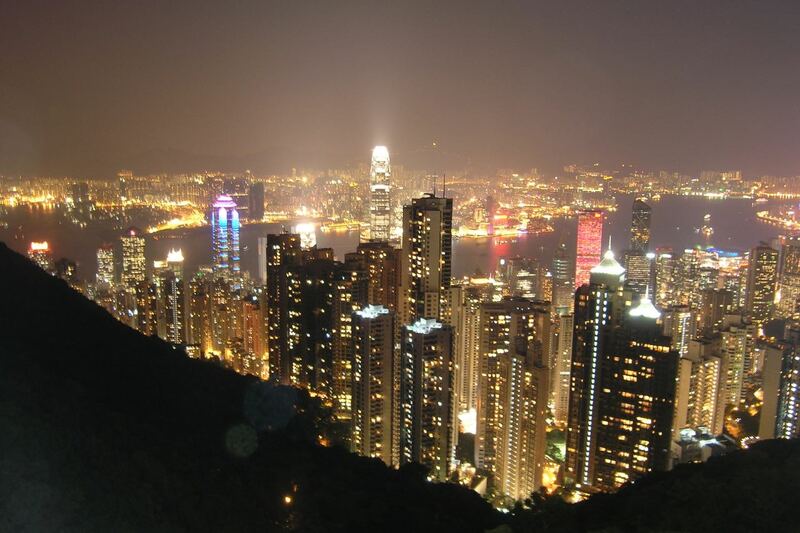 From what little we saw of it, it is very much like Hong Kong with a lot more affluence and very friendly people. People were very helpfully ushering us to the front of the metro doors with a smile and then onto the best seats inside the train carriages, seeing as we were fully laden. The metro is the same, modern system as in Hong Kong, with new carriages and sliding doors between the platform and the train. It’s just as high tech and modern here as in Hong Kong too and with the friendlier people compared to China, I’m once again glad to be back in this part of the country. It’s perhaps unfair to label the Chinese people inside Mainland China as comparatively unfriendly, as the language barrier was probably more the source of this impression rather than the Chinese people themselves. We made our one change and took the second line to its termination point, where we made our way into the larger train station above to see about our high-speed through train tickets into Kowloon. There was a bit of sticker shock waiting for us at the counter. The first option she gave us was the next outbound train at ¥209 ($25) but soon realised that there was only one seat left available. This was the case for the next train also. The only service we could get on, in fact, was the more expensive ¥253 ($31) so I reluctantly handed over our now dangerously dwindling stocks of ready cash. We really didn’t have much choice in the matter, as staying an extra night here in Guangzhou whilst we sorted out other alternatives really wasn’t an option with flight to Bangkok leaving our early tomorrow morning. The one good thing about the tickets we bought was that we now had a couple of spare hours on our hands and we were going to use these to rest a bit from all the traipsing around the city we just did with our backpacks wearing us down. Did I mention that we really should send some stuff home soon already? We were both a bit peckish now and Sandy had spotted the arches of golden yellow just outside the terminal building so we made a beeline for there and topped up with some fast food. This particular MacDonald’s had what looked like a long breakfast bar in the middle of the restaurant with network terminal ports and electrical outlets. Apparently, we could sit and surf the net as we munched on our MacNuggets. I couldn’t get the Ethernet connection to work but they had free phone cables to use and a free telephone number to dial so I hooked up using the laptop’s built in modem instead and was able e-mail and browse quite successfully. We used the opportunity to study our bank balance and statements online. I’ve been using rough estimates for exchange rates with my budget calculations but I could now see exactly how much money was being deducted from our bank account each time we used the ATM cards. Having eaten our fill and surfed the net for a while, we made our way back to the train terminal and completed all the immigration formalities with little fuss. Our train seemed to also be full and the journey was very smooth and comfortable. It was a high-speed train but it did slow down several times along the way and we made it into Kowloon after about two hours. There was a money change window at the station and I took the opportunity to convert all the remaining Remnibi we had into Hong Kong Dollars. Actually, I didn’t change all the money. I’m keeping one of each bank note and one of each coin of local currency from all the countries we visit. I did the same when we travelled through Africa and the Middle East. Technically, Remnibi is not allowed outside of China so we’re hoping we don’t get singles out for a thorough search of our bags before we have a chance to send another parcel home. All the coins we have accumulated are really starting to add up in weight. Our plan was to go back to the same guest-house we stayed in when we were last here in Hong Kong but just to be on the safe side, I thought we’d better give them a call to see if they had any rooms. It was a good job I did, as they hadn’t. After some persistence on my part, I finally managed to get a recommendation and phone number from them for a guest-house here in Kowloon. They too were fully booked but the woman did seem to have an alternative option for us and with a lot of communicative difficulty, we ended up agreeing to meet up in the lobby of the one Holiday Inn hotel here in Kowloon. We had to get a taxi there but it was only HK$16 ($2,15) on the meter. He did hit us with another HK$5 ($0,65) each, though, for the bags. We met our waiting guest-house proprietor in the lobby as planned and she was extremely friendly and helpful. She wanted to make sure that we understood that we were now in good hands and that we didn’t have to worry about anything. She walked us across the street to the next building and up the slow elevator to the fifth floor where apparently her sister’s guest-house was located. With the promise to make sure that we stayed in her guest-house the next time we would be in Hong Kong, we bid her farewell and said hello to her sister, who was no less friendly and appeasing. We had the choice of two rooms, one with a single double bed and one with two single beds. The rooms were both very small and smaller, in fact, that the previous Hong Kong guest-house we stayed in over on Hong Kong Island a few weeks ago. I wouldn’t have thought it possible to get a room any smaller but these certainly were. The room with the double bed was almost completely occupied by it and we would have nowhere other than the bed itself to put any of our stuff. The next room was just as small but with the small isle created by the two beds, we would at least have enough room to put the bags onto the floor. The bathroom was nothing more than a very small shower with a toilet and washbasin crammed into it. It couldn’t have been more than about one meter by about three quarters of a metre. There were no outside windows but with the entire wall surfaces nicely tiled and the room spotlessly clean, we would be more than comfortable here for just the one night. There was even an air-conditioner with remote control and a TV, although we never turned it on. Soon after accepting the room for the HK$200 ($27) per night asking price (with everywhere seemingly fully booked, I didn’t see much room for negotiation), we asked if she had a recommendation of where we could go to get a nice steak dinner. I had to make my impressive cow impersonation before she got the point and she told us that she would make a phone call and get back to us. Just exactly what that meant was anyone’s guess but I thought no more of it. A bag load of laundry was cheaper here too at just HK$20 ($2,70) so we took advantage of this and treated our main, daily clothes to a good service wash. I shudder to think just how black the water must have looked like once they were rinsed through. I’ve worn my zip-off trousers and fleece top pretty much every day since we entered China and this was the first time that they had been washed since before we left India. We both showered and freshened up whilst tiptoeing around each other in the very cramped space. We had just gotten dressed when there was a knock at the door. I was rather puzzled when I opened it to find the proprietor and a delivery boy standing there with a plastic bag full of takeout Chinese food. I asked what this was all about and she told me this was the beef I wanted. I didn’t order any beef, I told her but she just replied with her equally impressive cow impersonation and it suddenly dawned on me. I told her that what I was asking for earlier was a recommendation on where to go to eat, not to go ahead and order food for us. She looked very concerned about having just ordered a bag load of food with nobody to pay for it so I asked how much it was. At just HK$20 ($2,70) each, I figured it would be a nice appetiser and took the food. It was also as much to avoid the hassle of trying to communicate the mishap than anything else. I handed over the money and we sat and ate a few bites of rice with vegetable beef and soup. Under any other circumstances, I would have enjoyed this meal for the price, particularly as this is Hong Kong, but we had both set our heart on a nice juicy steak tonight so we didn’t eat too much. We set out into the comfortably warm evening in shorts and T-shirts and went in search of a steak dinner. This being Hong Kong, there are dozens of shops selling everything imaginable and quite a few of these were selling mobile phones so we decided to have a look around the see if we could find a nice cheap tri-band phone to replace the one I lost in Beijing. After about an hour of walking around, however, it became clear that this was definitely not the place to buy mobile phones cheaply, even after haggling the prices down, so we gave up and continued our quest for steak instead. This quest went on for longer than either of us was really prepared to tolerate and we ended up passing the same streets two or three times. We did stop at one place long enough to be served a cup of water but the dishes they were serving were pale substitutes for what we were looking for and we decided to leave and take the metro over to Causeway Bay where we knew we could enjoy a huge prime rib steak at the same Outback Steakhouse that we had previously eaten at. Just as the last time, it was very expensive but we felt we had both earned a little pampering. When we got back to Kowloon, we looked at the options for getting to the airport in the morning. With now very little ready cash left, the HK$100 ($13,50) express train was just outside our reach but if we cashed in our Octopus cards, we would have enough for the bus. To make sure of not having to wander around in the morning with our backpacks looking for the bus stop, we went in search of it for orientation before heading back to the guest-house to turn in. Overall, we are still doing very well with the budget, but we did spend a lot more in China than was probably necessary. We spent a total of $1,868 over the course of twenty days in the country for the two of us (an average of $94 per day). Given that we are budget backpackers, this is a relatively very high figure. There are several factors that contributed to this figure being so very high. Firstly, we stayed at the nicer end of the budget range of accommodations and always took a double room with ensuite bathroom – the most expensive type of room. Several times, we even went into the mid-range, which was more expensive still. Secondly, we ate mostly at nice restaurants and had more than our fair share of fast food (we were never under the illusion that we were going to keep ourselves going on curbside food stalls even though that would have been very much cheaper). China is a fantastic place for food – if you like noodles and rice and neither of us particularly do. Thirdly, we covered a lot of ground (China is vast) and did a lot of this travelling around using the most expensive means possible. We flew a couple of times and took several soft sleeper class trains. We could have saved a lot of money, for example, by travelling by bus more often. At the end of the day, we chose to travel with a high degree of creature comforts throughout China and this is reflected in the amount of money we burned through. In the grand scheme of things, we are still ahead of ourselves, having spent less money than we expected in India and Hong Kong. The excess we spent in China is less than the savings we had made in the other places so we are still in good shape. It has to be said, however, that we don’t have much more daily allowance for some of the more expensive countries ahead such as Australia and New Zealand. If we cannot save much money in the relatively cheap countries such as China, then we need to be very careful about our spending habits in the months ahead. Everyone we’ve met have told us that China was more expensive that they had originally planned for and this, together with all the other reasons I’ve cited above, makes me feel quietly confident that we will still be OK in the long run. Time will tell. If we’re begging for food six months from now, then I will kick myself for not being more frugal this early on in the trip.